In our busy fast paced world, getting that “5-a-day” serve of fruit and vegetables can prove difficult. Most of us don’t achieve it, even though we know we should. Sometimes the idea of chowing down a whole plate of greens just isn’t that appealing. One of the enormous benefits of green smoothies is that you can cram a whole day's worth of goodness into just one glass. Yet research has shown the benefits of eating fruits and particularly, green vegetables. We know that these foods are important sources of dietary fiber, vitamins and minerals. They also help protect cell damage caused by pollutants and ageing. Green smoothies can be as simple or as fancy as you want to make them. You can achieve an extremely tasty, nutritious drink with just 3 or 4 ingredients, or you can throw everything into the blender for a nourishing drink. Ingredients such as oats, seeds will turn a simple drink into a satisfying meal. Smoothies are the healthy version of “fast food”. But before you rush out to your nearest smoothie bar, be aware that many commercially prepared smoothies are high in sugars with artificial colors and sweeteners. The solution? Make your own smoothies. Modern blenders make this easy. Those high speed machines will easily pulverize most fruits and vegetables, including the core of a pineapple and leafy green stems. Many fruits such as apples and pears can be left with the skin on, saving valuable preparation time. Simply scrub, chop and throw into your blender. 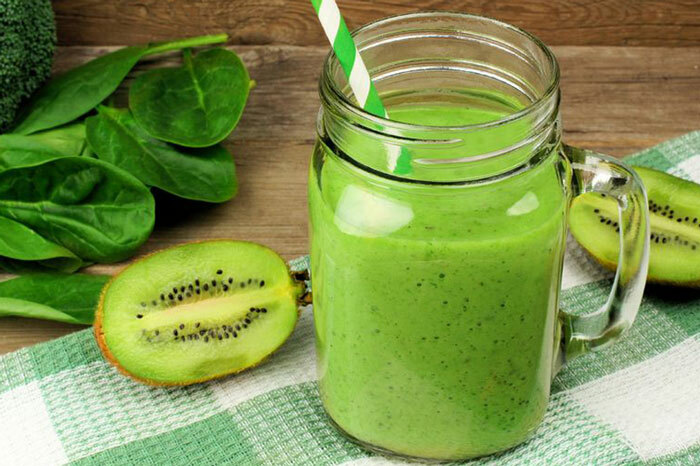 Give caffeine the flick and replace that morning coffee with a healthy green smoothie. It really will set you up for the day and you won’t suffer that mid-morning energy. It’s also now possible to buy to-go cups, so taking your smoothie with you and eating on-the-go becomes a breeze. Even when you’re rushed and busy it’s still possible to eat a healthy diet. Cooking destroys many of the nutrients found in vegetables. Because smoothies are made by blending raw ingredients, none of the nutrients are lost. The difference between smoothies and juices is the fiber. Juicing extracts the juice from the fruit and leaves behind the pulp. Whereas smoothies are made using the whole fruit so the plant fibers are retained. This is the same as eating the whole fruit. Fiber is very important for the body as it cleanses and helps eliminate waste. It also gives you a more filling drink. Because the “meat” of the fruit is included you will feel fuller for longer. Blending also has another benefit. High speed blenders easily break down the cell walls of leafy greens unlocking their nutrients, antioxidants and phytonutrients. By breaking down the cell walls of the fruit and vegetables into liquid form, the nutrition contained in the plant becomes easy to digest. Once you start sipping your smoothie, the body immediately starts absorbing the nutrients. It also helps if you sip your smoothie slowly, rather than drinking it all at once. Drinking your smoothie more slowly allows the body time to digest the fiber, whereas drinking too quickly will leave you feeling bloated. Vegetables contain few calories. Provided you don’t add lots of sugary juices, ice cream or other high calorie foods, smoothies are a boon for weight watchers. Because of their high levels of water and fiber smoothies are very filling. Pureeing the vegetables leaves the fiber intact, makes you feel fuller and more satisfied, fights those cravings and stops you overeating. Regular consumption of fruits and vegetables helps eliminate those sugar cravings thus keeping you away from the chips and the chocolate. Not everyone gets excited by a plate of greens. If you aren’t a salad person, green smoothies are a healthy alternative. In fact you are more likely to get your daily serve of fruits and vegetables via a smoothie, than if you ate each item separately. Two cups of blended fruits and vegetables is more than enough to provide you with your daily recommended serve. Getting the kids to eat their greens sometimes requires some ingenuity. Green smoothies make this easy. Use fruits that have a sweet taste to disguise the taste of the greens. Also start with a mild tasting green such as spinach. To begin increase the amount of fruit in the smoothie until they get used to the taste. Then gradually increase the amount of greens and hopefully they won’t notice. Make sure the smoothies are a nice, bright color. No-one’s going to drink anything that’s a yucky brown color. If you aren’t fond of drinking water, smoothies can be an easy and tasty way of staying hydrated. Smoothies require a liquid base, and this plus the water already present in fruits and vegetables will keep up your fluid intake. It’s very easy to become dehydrated in hot weather, and a cool smoothie can be refreshing and thirst-quenching. The nutritional benefits of green smoothies is unparalleled. Leafy greens are a rich source of vitamin K as well as other important minerals such as iron, calcium and potassium and many vitamins, including folate. They also contain omega-3 essential fatty acids. Dark green leafy vegetables offer the most concentrated source of nutrition of any food. The antioxidants present in vegetables will help to detox and cleanse the body as well as give you increased energy and improve your health. Once you start drinking green smoothies you will notice you have increased energy levels. If ever you needed any motivation to join the green smooth revolution, then this is it. Because smoothies are rich in fiber the toxins in your body are flushed away naturally, leaving you with a healthy glow. Nourishing the inner you automatically improves the outer you. The benefits of green smoothies are so great and so beneficial to our health, that we should all make them a part of our general routine, no matter the time of the year.